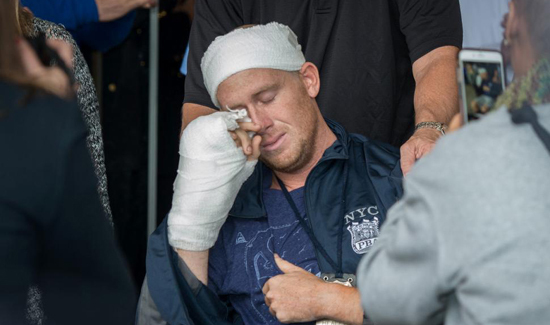 In this video taken by the New York Daily News you’ll see over 200 fellow NYPD officers cheering on Officer Kenneth Healey as he’s wheeled out of Jamaica Hospital by his father, a Nassau County police detective. Touched by the support, Healey wipes a tear from his eye with his bandaged hand and gets up out of the chair to walk the last few steps into the ambulance himself. A police bagpipe band accompanies the scene. Healey, a rookie on the force, is on his way to recovery after being viciously attacked in the side of the head and right arm by a hatchet-wielding lunatic. Wish him the best of health to get well quick. I thank him for his service with the NYPD and all police departments throughout the USA as they put their lives on the line day and night to keep us safe.